Are you a customer at Lockaway Storage in Leon Valley, Texas? Then it’s time to get your donut on! Facility Manager Jordan Ames will be giving away sweet donuts to his even sweeter customers November 20th, 2018 starting at 9:30 a.m. until 12:00 p.m.
“What is the occasion”, you ask? It’s you! Jordan is excited to give back to the customers that made his year so great. Being busy at Lockaway Storage is a good problem to have, and Jordan loves being able to thank the customers for the impact they have on his year. In the past, Lockaway Storage on Leon Valley has dished out tasty treats like pizza. This time though, donuts seemed like a good idea. “This time, I figured we would keep it a little bit more low-key. But we will be getting Shipley's Do-Nuts. They are my favorite,” Jordan said. Even though Jordan’s favorite donut is glazed, he understands that having a variety of choices is important. “We'll probably get a dozen glazed, and a dozen frosted chocolate,” Jordan said. If you aren’t a fan of donuts, you could always stop by and pick one up for your favorite donut-loving friend! 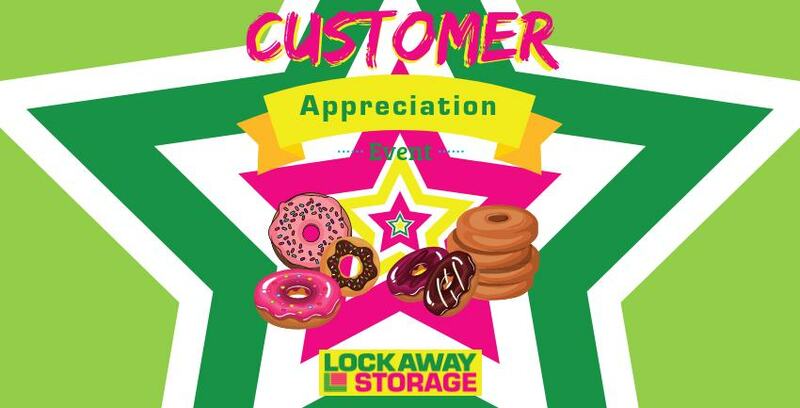 Since we know that there are plenty of donut lovers out there, don’t hesitate to come by, chat with Jordan, and feel the love at this customer appreciation event!